We have been waiting quite a while for a product like the Theiling Automatic Rollermat. 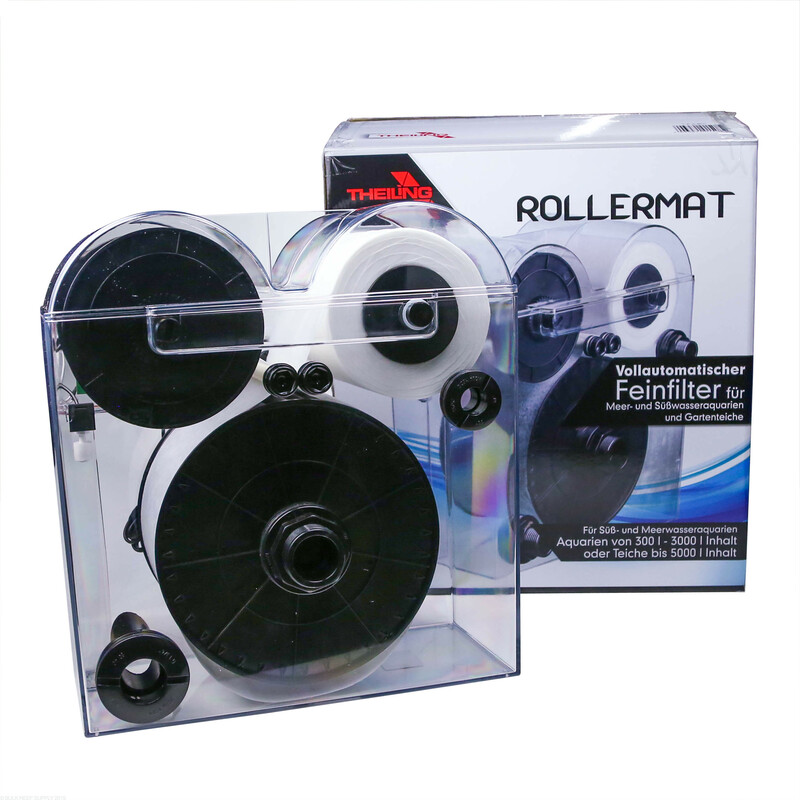 With the Theiling Rollermat it will automatically unroll fresh new fleece to trap and collect free-floating debris and detritus from your aquarium. Usually, anyone that runs filter socks in their sump will have a few handfuls of socks laying around that need to be cleaned and can take up quite a bit of space. With the 12v electric motor dirty fleece will be removed from the water allowing new media to take its place when the current fleece is starting to clog. Recommended flow rates between 200-600 gph through the Theiling Rollermat. Due to the manufacturer of this product being in Germany the bulkheads that are already installed on the Rollermat are metric. If you wish to use US (standard) bulkheads for the input and emergency drain we suggest purchasing the Theiling Adapter Kit. Please note the main drain is a metric bulkhead that cannot be replaced with a standard bulkhead. 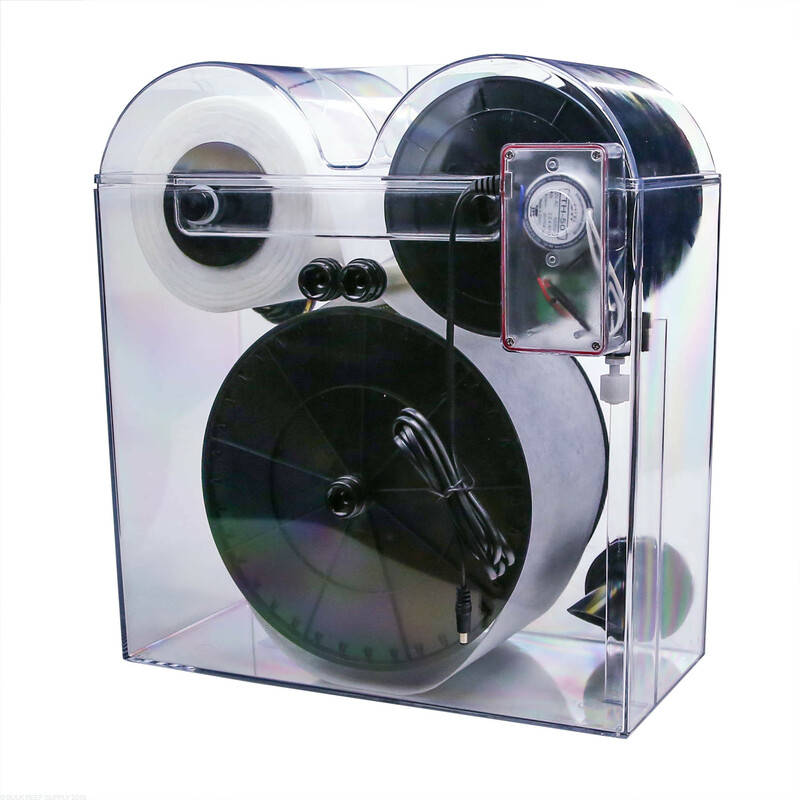 Your tanks drain line can be directly attached to the input of the Rollermat, or a stand-alone pump can be used. We do prefer to use a DC controlled pump for ultimate flow control but any pump up to 600 gph will do just fine. This roller mat with the roller mat sump combination keeps my aquarium immaculate. The best part is I don’t have to deal with washing socks constantly but I get the same benefit of having socks. It is an easy attachment to the roller mats up which works great with the skimmer and refugium. I have been using this product for five months now. I can honestly say, hands down, this is the best investment I have made for my reef tank. I have a 240 gallon with tons of fish and corals and the tank is growing coraline alagae like crazy. The corals look great and the fish our super happy. I just don't get all the folks who are complaining. First, the product description clearly says, metric conversion is required and you still complain. Dont buy it and then bash a perfectily good product just because you have to spend two extra seconds and a few extra dollars to buy conversion bulkhead fittings. People like you are the reason our hobby is lacking inovation. For those who bought this product and it doesn't work exactily the way you want it to work, get over it. These kind of inovations will only keep comming and get better if we the hobbiest continue to support the inovations. The R and D for these products cost hundred of thousands of dollars and if hobbiest dont support these investments, no investor will be willing to put forth the money for R and D.
Going on two months with no major problems. New technology is welcomed and is needed in this market. I can deal with a few imperfections because at the end of the day, it does what I bought it to do. The idea of not having to deal with filter sox is wonderful. This product does work well. It is hard to plumb. It has metric fittings. The conversion fittings are an extra expense. It is large and bulky making it unlikely to fit in a cabinet in a sump under your tank. It isn't easy to service! Removing and replacing the rolls isn't a trivial task. I wouldn't recommend this product. I want to love this product but can’t. The gear that drives the take up reel is plastic. Gone through 2 already. I’ve also had the float valve fail once resulting in the loss of a full roll of felt. Hopefully they take this V1 design and enhance it a bit. Concept is great! I want to love this product. Unfortunately, I can't recommend it. I've just installed my 3rd roll, having successfully gone through one roll, and struggled with the first one. Upon inspection when changing the 2nd roll, I saw both cardboard tubes were covered with black mold. Given the exposure to moisture, I'd think paper wouldn't be an option for any type of filter. Setup was brutal. The first two months the system kept going offline. I did the usual replace motors etc. Ultimately we determined the roll had been cut at a slight angle, causing it to continuously go out of alignment. I gave it two stars because I believe there is potential. It's a good idea and it catches detrius. Perhaps they will stop using paper in the future. purchased 7/4 failed 9/25 needed replacement motor. didn't even get through the first roll!!! 2nd flaw happens because of the circuit board design, the board has constant power running to it which is a issue because it over heats itself and the motor fails. The fix was easy. 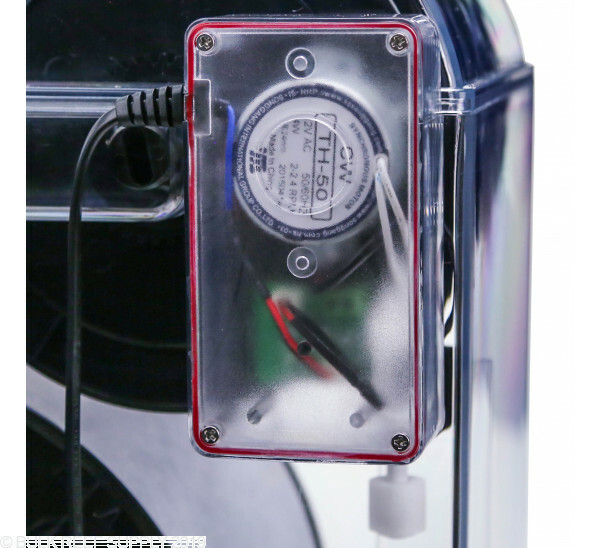 Open the access cover on the board, remove the connections of the float switch and run them to your apex, now jump the the contacts on the board together with a short wire, the contacts from which you pulled the float switch from. Put the power supply on apex outlet to only come on when float is closed. 3rd flaw is the cover being on builds condensation from the warm circuit board. Thin plastic feels like it is going to break it you move it wrong. Hard to get the top on and off. Extra plumbing conversions make it sit farther from the sump then you I like. But I want to mention something that hasn't been covered in the reviews yet. It would be really nice if the clip that holds the float valve for this thing was adjustable, so I could have it use more or less of the roll as my comfort level with how dirty the used portion gets, changes. Currently the used portion gets a little too dirty for my liking, and has caused my nitrates to go up from the level I was keeping them at with filter pads/socks. If I could get the float valve to trigger sooner, it would get the waste out of the tank faster, not allowing it to decompose on the filter paper for quite as long. But overall, it seems like a beta version of a great product. It just needs a little more work to tackle some of the issues, and it could be must have for all reefers. P.S. We have this mounted so the pipe that dumps water into the sump is just above the water line in the sump. This caused an issue when our Auto Top Off put a bit too much water in the system, causing the float valve to trigger and waste an entire roll of filter paper. 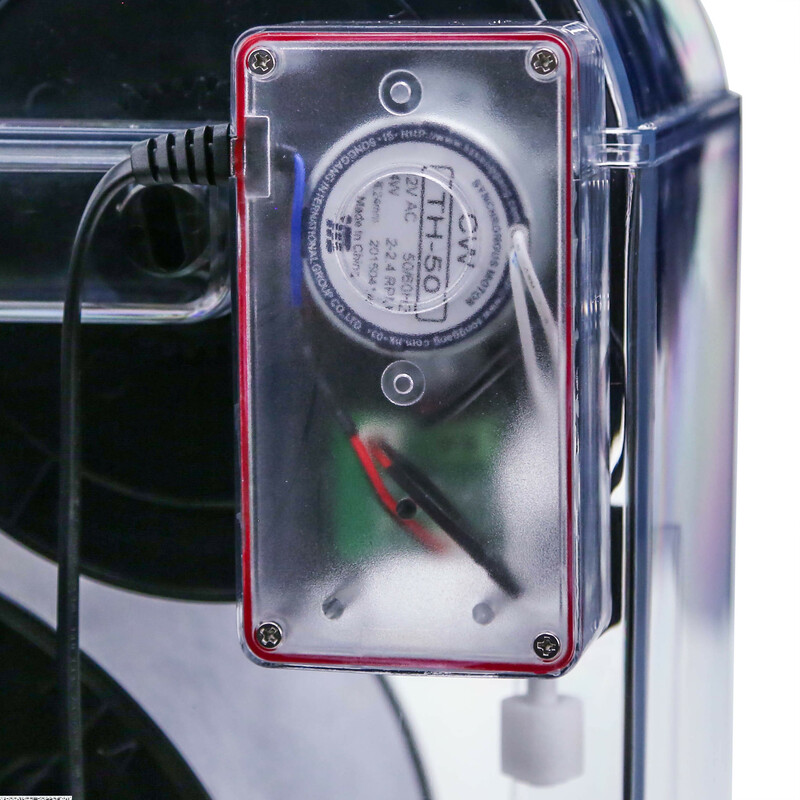 We have since added it to the Tank controller so that when the float switch in the sump is triggered, this thing turns off. It also turns off in cleaning mode. I have had a few problems with feed roll dragging as well. I also have had a few snails make their way in, so that might actually be my problem. I wanted to point out my drive motor shaft is rusting. It might be a good idea to put some silicone grease on the motor shaft to prevent this. I am glad BRS is selling replacement parts as I will probably have to replace the motor & drive gear at some later time. Regardless of the issues I've had, I like my rollermat and would consider purchasing a second one if I can figure out how to fit it in my sump. What are demensions of the unit? There is only on inlet I have two coming off my tank can for my drains. Can I merge to one or will I need to put another bulk head in the box? How high is the output from the bottom of the unit? What is the water level max, min and suggested for the roller mat? The Theiling rollermat is designed to operate above the water level of your sump so that the processed water can freely spill into the sump. There isn't really a min/max water level required, aside from making sure the water can flow freely down and out of the central bulkhead and into your sump. Would if be feasible (or advisable) to install a second input - such as for the secondary line in a bean animal installation? I would think you would want both the main and secondary to go into the roller mat, and the emergency to go straight to the sump? How much clearance space is required above the unit's mounting location? It's 19" tall. How much space above that to remove the lid and replace the filter medium? 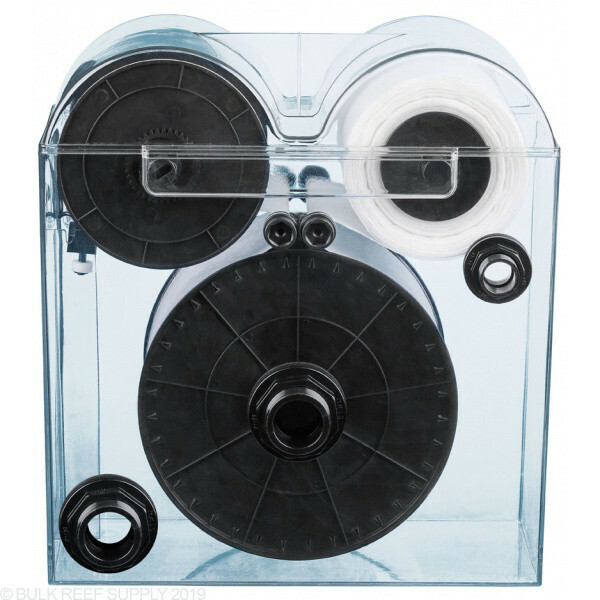 Do you have to be able to get your arm in there to wrap it around the big chamber from the feed reel to the take-up reel? If this is in a cabinet below the aquarium with a sump, space is at a premium, so I'm challenged to fit this in. How does it mount? The plumbing is clearly coming out on one side, but it looks like the back isn't flat either, thanks to the motor sticking out. Seems like the motor should have been mounted on the front so you had at least one completely flat side to mount it. In order to fully remove the lid with the roll you will need an additional 6" above the 19" of the unit itself. This does not really have a mounting option but rather can be placed in the sump on a stand or external on a stand. Will my ato be affected as the mat fills up with detritus, and the water level rises to trigger the roller mechanism? The Roller Mat’s overall tank size rating will highly depend on the bio-load and overall amount of free-floating particles it needs to remove. For larger tanks, you may need multiple rollermats, as they are only rated to handle 600 GPH or you could have a stand-alone pump deliver water to the rollermat as well. How do you clean the crap that accumulates in the bottom of the Theiling Roller Mat? In almost all containers, sumps, tanks, roller mats, etc will eventually have detritus build up on the bottom. To remove it we suggest just treating it like a water change, and siphoning out the detritus as necessary. Generally how long do the felt cleaning material last before needing to be change? Will vary on how much waste it put in however standard is around 2.5 months. How exactly can this be plummed ? Right now I have my 120 Gallon overflow that just uses gravity that falls into my 30G sump below into a filter sock. Can the roller mat just sit right in my sump, my water level on that side of sump is 9" high.? 10" wide seems very big! The Theiling Rollermat can be plumbed in a variety of ways. The easiest would be to let your tanks main drain flow directly into the rollermats intake. 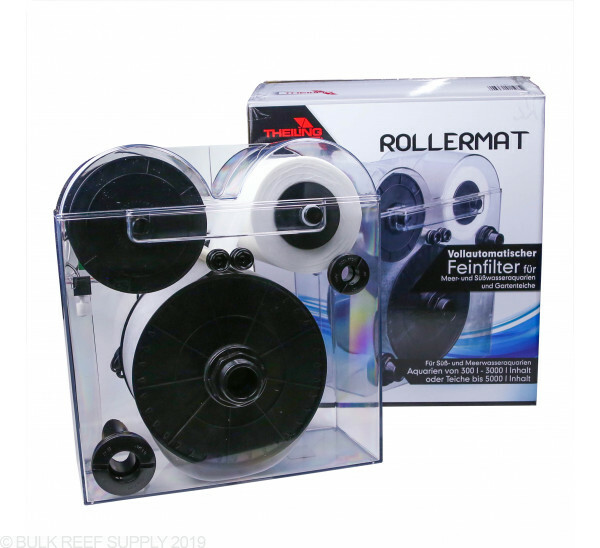 It is not all that small, and if you could set it on top of your sump that would work, however the rollermat will need to freely drain into your sump. If you place the rollermat in your sump, you will need to be cautious of the water levels and how water how water flows through it. If you cut a rectangle out of cardboard or something stiff with the dimensions of 17 x 10 inches, then you could “test fit” it first. Does it come with a mat fleece or do I need to buy that separately? The Theiling Roller Mat does come with 1x fleece roll. We would suggest picking up an extra just to have on hand for when it is time to change it out. What warranty does it have? The Theiling Roller Mat comes with a 1 year warranty from the date of purchase.